She travels Florida spreading love everywhere she goes. Retro in style with her original plaid fabric. what all is stored inside. have 3 point seat belts. This is one feature we love! for cooking, dining, and cleaning. We also supply a reusable grocery bag. while visiting our beautiful state. For the dining room, just add the table provided for you on the side of the back cabinet. The table can be used inside or partial outside of the bus. 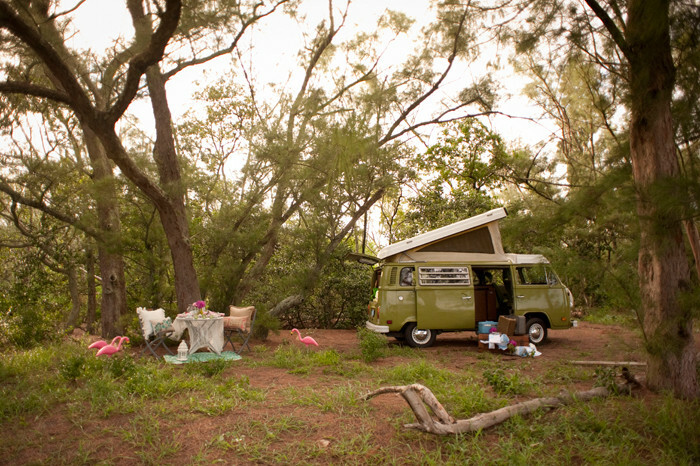 We have updated the dishes to very cute VW Bus dishes to add into the experience. to one of two double beds. in the top of the picture. more head room during the day. when your ready to use. We provide two sets of sheets, one for the upper and one for the lower. and used as a blanket. The top pops to reveal the second double bed. a tent or a tree house. If only two people are traveling, you can sleep upstairs and keep the downstairs set up as your living room. We found Jasmine in Asheville, North Carolina. She was owned by a young women and spent much of her life touring the states. Her former name was Voyager, but I felt like Jasmine was more suitable for her personality. We took her completely apart and restored her to near perfect. She has been touring the state of Florida going on 5 years and by now.... knows her own ways to the Florida Keys! Jasmine enjoying one of Florida State Parks campgrounds. 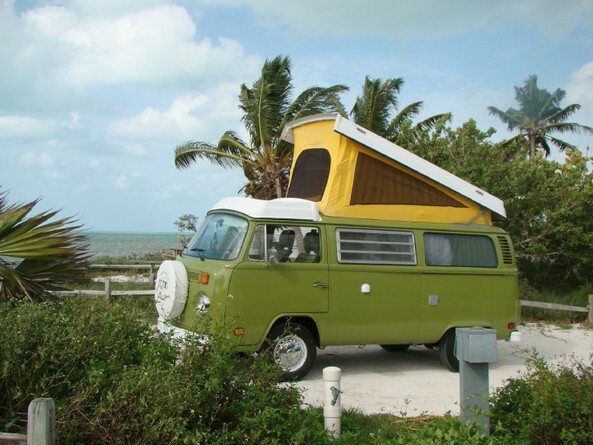 The ever chainging beautiful view of a Bay Windows on a VW Road-trip.